Our orange and barley is blended with passionfruit to create a great tasting thirst quencher for the whole family. Made without preservatives, artificial colours or flavours, we've put a refreshing twist to this favourite flavour. I and a huge juice fan,and I prepare fresh squeezed juice or a juice syrup so when I was visiting a friend and she offered me juice and since I hadn&apos;t seen this brand of juice I was skeptical but after the first mouthful I was stunned, I fell in love with this juice!! I love passionfruit so to taste that first, then the orange and to be told it also had barely in it I was amazed. The embossed glass bottle makes the juice appear more posh than other juice containers on the market. The white label on the bottle also is great because with the white background is like the manufacture don&apos;t want the attention taken away from the juice product!..and the font used adds that extra bit of poshness with the fancy choice of lettering. I used the juice in a butter cream icing to ice blueberry muffins and the taste with amazing it paired together so nicely I had friends commenting on what I had used in the icing to get such a sharp and fruity flavour and they couldn&apos;t believe it was a juice concentrate. After the muffins I used it in a cream cheese icing to ice a carrot cake and again it was divine and helped to cut through the sweet taste of the cream cheese and icing sugar. Definitely something I will do again! I was so impressed with how the juice worked in the icing I decided to mix some into a marinate for honey chicken and again it worked perfectly and gave the chicken a nice flavour and caramelised the cooked chicken so it was sticky and finger licken good. Paired with anything I think this juice will work well. Or mixed with water and served chilled will work perfectly as well. I can&apos;t wait to find more uses for this great juice concentrate and when used just as a juice it works out economically and much cheaper than other concentrates....and can be mixed up sweeter or can add more water if you don&apos;t like sweet juices to drink...it is all up to your personal taste. 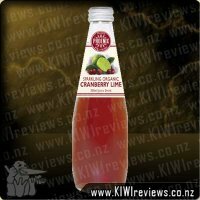 I have been given the chance to review this fantastic fruit syrup and have to say it is eye opener, at first I never thought it will taste so good as I have no idea on these stuff just until now. We only have bottled soda and powder juices. At first looking on the bottled fruit juices like this is a little bit intimidating as their prices are way up higher than the sachet powdered juices. But now that we've tasted this, it definitely justified the price. 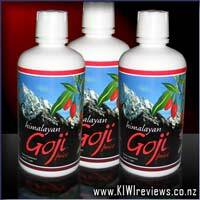 It has no after taste and absolutely beneficial unlike those with lots of preservatives like the powder juices. I like orange but no idea how barley would taste as when I think of barley I associate it to smell like malt, I might be wrong and totally clueless as back at home we're not familiar with these kind of mixes and I would like to say I so love it!!! 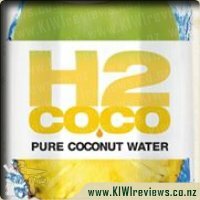 As soon as it arrives, I made a litre and in no time, I already drank half of it, actually I couldn't stop and it made me drink more often, which is good as drinking just plain water has never been my habit. It is so refreshing; I can see myself drinking this all day long. I also like the idea that it is glass bottled and I like to recycle stuff, I can find many ways to use the bottle, one is to make more Barkers' juice. I like to experiment on food especially on my baking so I'm sure I can come across on how to use this and incorporate it on my baking, yay keeps getting more exciting! I would definitely buy and include this on our grocery list and recommend this to family and friends. Plus I forgot to mention that this Barker's Orange and Barley with Passion fruit Fruit Syrup and the other flavors are awesome gift for any occasion to family and friends too. We try not to have too much juice in the house, as then thats all the kids want to drink, but this syrup is actually worth having in the fridge. One part syrup to six parts water means that this works out to about a dollar a litre so is much cheaper than the carton juice we usually purchase. 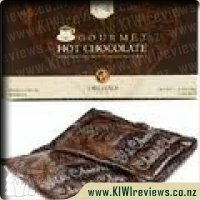 Its also great to have on hand as lasts for ages even when opened if kept in the fridge. I got this the day we were trying out a new cupcake recipe, which uses orange juice instead of milk, so I thought I would try this in one of the batches. It didn't work as well as freshly squezzed orange juice but was a fine substitute and my girls preferred the syrup flavour to the plain orange juice batch. I like that this is in a glass bottle so can be reused or recycled easily. Yummy! I can't speak to the life-span of the opened bottle... it never made it past 3 days, let alone getting even close to the "7 days after opening" rule I normally stick to when it comes to refrigerated goods. I had a LOT of fun with this drink, more so than the Lemon and Barley because I just loved the orange flavour. Mr12 loves it, and surprisingly Mr4 also gave it the big 'serious and thoughtful "Yum" of approval' he reserves for the really good stuff... and because it has no artificial sweeteners, colours or preservatives, I can relax and let him drink as much as he feels up to, without risking him flipping out into one of his artificial-additive-induced manic sessions. Double-plus-good in my books! Overall, this was a wonderful syrup to have on hand, to the point I went out and bought two more bottles just so could have them available when the warm days finally decide to make an appearance again. I plan to explore this syrup's potential further, so I fully expect to be buying a bottle or two a week when the sun is visiting us daily again. Orange and Barley with Passionfruit to me seemed like a strange combination for me but I was willing to give it a go. Made it up 1 part syrup to 6 parts water like it says on the bottle and put it into a 1 litre jug, tried it warm and to be honest I spat it out I wasn't impressed at all, so I put it in the fridge to chill it. After a good chilling time in the fridge I got up and tried it again, just a small bit this time, just in case. 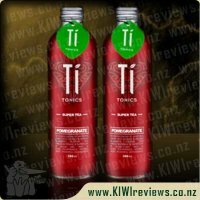 And I had 3 cups it was good, tasted refreshing and the whole 1 litre gone in a day and another made. 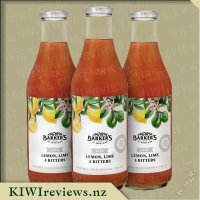 I loved the Barker Lemon and Barley syrup - i also love orange and passionfruit so i thought what's not to like about this drink!! It also is an award winning one so more bonus points going out to it for that. I really enjoy Barkers Syrups hot so i first tired this one that way. I found it very sweet, although it was drinkable i don't think i would purchase it for that use. My children LOVE it - along with my partner, they make it up as needed in glasses (we have a cold water thing on the fridge so its cold when drunk straight away). I like that its easy and not a hassle for my partner to make up - he doesn't make any mess either! The bottle is a great design and there are no overspills or leakages. I would like to try some baking with it - another reviewer made a cake, i think that would be really nice. Or perhaps in an icing as a nice alternative. I think that this would be nice and fruity in a punch or added onto ice cream/fruit salad. 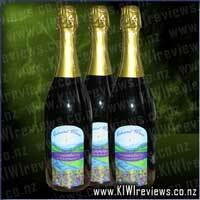 The price is excellence as the bottle goes a long way - makes up to 5 litres. Makes it a lot more economical that some juices - and a lot nicer!! Out of all the products i have tried from Barkers, this would be my least favourite, purely due to the sweetness. I cannot really fault it as the flavour is nice but just not my personal preference. 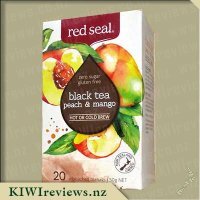 I don't generally drink anything with orange as for some reason I have a reaction to orange and end up hacking up lots of flem. But, gave this a go and was happy to find that I didn't react to it at all. 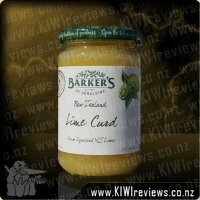 I looked up on Barker's website as I knew from a previous review, that they have a list of recipes and I wanted to see what some of their suggestions were. One of them was with vodka. Now, I didn't have have all the ingredients the listed, I had 3 out of 5, but still, variations sometimes come out with great things. 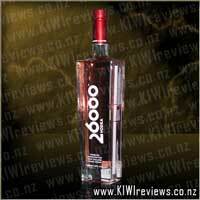 So I did 30mls vodka, 30mls of this syrup and 1/2 cup water. Just the right balance of everything, and it makes a lovely little drink. Again, I love the fact that this one bottle can do 5-8ltrs for my family, and it is a really good price. It's also nice to be able to drink orange juice again. Orange and Barley with Passionfruit... what an interesting flavor combination. It is estimated that each bottle makes up to 5 litres of drink if you follow the directions on the label. 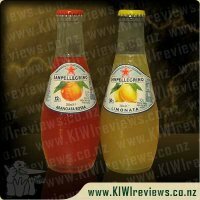 I preferred the Lemon and Barley syrup as a refreshing drink but this is because I am not a big orange or passionfruit fan. I do love that this product has no artificial colors or flavors, no preservatives and no artificial sweeteners but is a good source of Vitamin C. Due to this I don't mind my kids drinking more of it than I would normally let them have when it comes to flavored drinks. It is also nice used in the SodaStream too. I did add a wee bit of the syrup to a standard white icing when we made vanilla cupcakes and found it was a nice addition. I find plain icing to have a rather funny taste to it, so the hint of orange and passionfruit in the icing was really nice. I also used the syrup to replace the orange zest in the orange cake I like to make and found that it gave a slightly more orange taste to the cake and also found it left the cake more moist than it normally turns out, so was really pleased with that too. 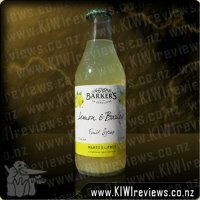 The Barkers syrups are really fantastic, you get a decent 710ml bottle for around $5.80 and as it is really good as a drink and for baking you are definitely getting your money's worth. We are having a BBQ this weekend and are looking forward to marinating the chops using this syrup as think it will be a really nice fresh change to the normal marinades we use. 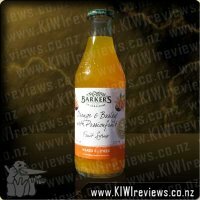 I was lucky enough to try another Barkers product, this time it was the Orange and Barley with passionfruit fruit syrup. As with all Barkers products I have tried, it was another great product which tastes great. I find with some other syrups that if you add too much syrup, the drink is ruined by the very strong taste, with the barkers one it just seemed to get sweeter, but the flavour was still good, which is a great thing. 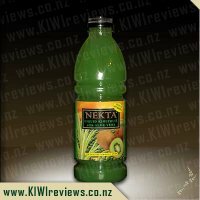 One bottle, if mixed correctly, will yield 5 litres of drink, which means it can go a long way, and is real value for money when compared to straight fruit drinks. I love the glass bottle it comes in as well. So all in all it was a great product, the hardest thing would be deciding on what flavour you want to get, to cover all bases you might as well get all of them, you won't be disappointed. I'm not a huge fan of orange drinks. They are often overpoweringly sweet. I don't even drink juice at full strength. With this drink, I tried it at the same strength I mixed the lemon and barley, but it was far too sweet for me. Mixing it at half the normal strength worked well. 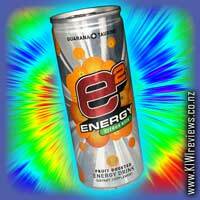 The orange flavour is nice and strong with this followed by the passionfruit. Because it was such a strong taste, I decided to mix it into a no-bake cheesecake filling for dessert one night. I added a few slooshes into the mix and let it set. The flavour was not as orange as I though it would come out but it still complimented the filling really nicely. All my guests were impressed. The next thing I tried was making up an orange syrup cake. I took a box of vanilla cake mix and substituted the milk out for the syrup. The cake came out nicely and had a wonderful orange/passionfruit flavour to it. I added some of the syrup to the top to soak into the cake. I think that was a bit too much flavour. But the cake itself was really nice and moist without the syrup topping. Like the lemon and barley, I tried the orange and passionfruit in beer, but it was awful. It just was not a good compliment to the bitterness of the beer. It was nice in lemonade though. Overall, I didn't enjoy this syrup as much as the lemon and barley one. However, I found the bottle is lasting a lot longer because I don't have to use as much to get the taste I like. It is versatile, but not as much as the lemon one was. I have tried many different Barker's products so I was excited to try some more of their range. I love that it is New Zealand made and contains some locally grown produce. It is also great to know it is free from artificial stuff. When I heard about the orange and barley with passionfruit syrup I thought it would be great in a fruit punch. At my next trip to the supermarket I even bought some ginger ale for the punch. I was too lazy and impatient to make a punch with a cold tea base so I invented a drink I call lazy punch. It consists of ginger ale and lemonade with a splash of the Barker's syrup. It tastes great with or with out ice. I have also had the syrup just with ginger ale or just lemonade. They are all great combinations especially for a non-drinker like me. I am sure that those that enjoy their spirits can easily turn these concoctions into cocktails. I have also tried the syrup with chilled water. That was nice but nothing exciting. With carbonated water it reminded me of the sparkling orange the Schweppes make. My children have also been willing taste testers and have happily drunk anything that I have made. I am yet to try this syrup in baking but I'm thinking it would make a good substitute for orange juice. It is a versatile addition to the fridge. Now I another need a lazy punch.